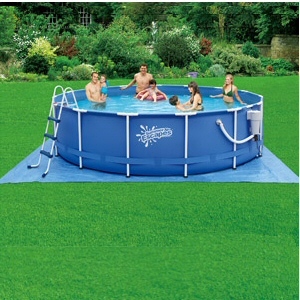 Summer Escapes 15' diameter x 42" tall round frame swimming pool is easy to set up and makes a summer escape quick and easy right in your own backyard. 3,900 gallon water capacity at 80% full! Super durable and extremely tough sidewalls are made with three separate layers of material. Inner layer of polyester mesh is laminated between two outer layers of heavy gauge PVC.